(Dodecanedioic Acid) DDDA Market size was over USD 370 million in 2015 and shall witness gains at over 5.5% CAGR over the estimated timeframe. The global (dodecanedioic acid) DDDA market size is primarily driven by its demand in producing high-performance nylon. The overall nylon production was roughly around 4 million tons in 2015 and is likely to exceed 6 million tons over the estimated period. Increasing demand for nylon 6,12 due to the paint & coating business expansion is analyzed to be the prime factor that would propel the industry growth by 2023. This high-performance nylon is widely used in manufacturing thermoplastics, which has a widespread application spectrum across greases, polyesters, detergents, fragrances, coatings, and adhesives. These products have an enormous demand in the end-user industries owing to the (dodecanedioic acid) DDDA market size. Additionally, the nylon 6, 12 offers value-added characteristics such as scratch resistance, flexibility, heat stability accompanied, and superior corrosion resistance, which make it preferred for applications in the automotive industry. Furthermore, owing to its properties, it is also used in manufacturing fabrics and ropes. Growth indicators in the construction business are analyzed to boost the overall (dodecanedioic acid) DDDA market size by 2023. The growing construction industry will substantially boost the product demand across paints & coatings. The product offers desirable solubility with solvents including water, acetone, and benzene and is therefore preferred in paint & coating applications. The overall construction expenditure is set to surpass USD 13 trillion over the projected timeframe. The construction industry essentially requires paints & coatings to upscale the steel & metal durability by providing them corrosion resistance. It also helps in enhancing the aesthetic appearance of the structure. In addition, the global paints & coatings production capacity was roughly around 1.5 million tons in 2015 and is forecast to surpass 3 million tons over the projected timeframe. This trend is analyzed to significantly boost the business growth by 2033. 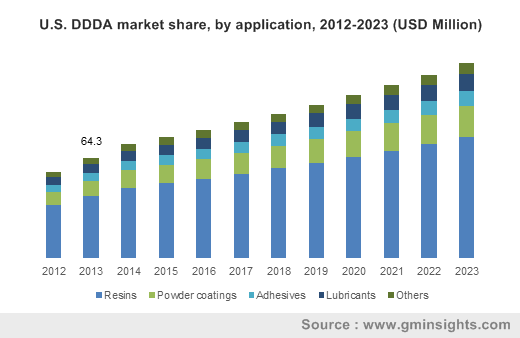 The rapidly growing automotive industry across the globe owing to the improved consumer lifestyles and spending dynamics is another prominent factor propelling the (dodecanedioic acid) DDDA market size over the estimated period. Paints & coatings are vital for the vehicle’s body parts including engine and body panels. These automotive parts require powder coatings to enhance the appearance along by providing corrosion resistance. The global automotive production, both commercial as well as personal vehicle, was approximately 90 million units in 2015 and is likely to increase by 2023. This trend shall boost the business growth. Furthermore, the product is also used in the personal care industry as an antiseptic. Increasing consumer awareness toward personal wellbeing will increase the product demand by 2023. The global (dodecanedioic acid) DDDA market size is directed and regulated by stringent environmental legislations toward VOC emissions. This may hamper the overall business growth over the projected period. In addition, the product faces stiff substitute threats from sebacic acid and adipic acid as these acids can be used in the nylon production. However, the emergence of bio-based (dodecanedioic acid) DDDA market share will create new growth opportunities for the industry participants. The bio-based industry comprises environment-friendly feedstock including fatty acids, fatty acid distillates, plant oils (nonfood), palm oil, palm kernel oil, and soap stocks. Resins held the largest share of the overall (dodecanedioic acid) DDDA market size in 2015 and accounted for approximately half of the total share. Rising nylon applications in fabrics, gears, and screws are the prime industry growth prospects for the application. In addition, growing nylon usage on account of its high elasticity, strength, abundant availability, and superior strength will boost the industry growth. Increasing R&D investments toward bio-based specialty polymer production, such as nylon, will further complement industry growth. The global (dodecanedioic acid) DDDA market size for powder coatings is forecast to observe the highest gains at more than 6% CAGR over the projected timeframe. Increasing paints & coatings and lubricants demand across the globe due to escalating construction and the automotive industry is the major factor positively influencing the business growth. Use in paints & coatings helps in providing superior corrosion resistance, high-quality finish, abrasion protection & resistance from moisture, heat, and chemicals as compared to traditional materials. North America, mainly led by the U.S. dodecanedioic acid market size generated a revenue of over USD 100 million in 2015. Increasing remodeling practices in the U.S. residential projects along with massive consumer automotive base are the major factors contributing to the regional industry share. The regional industry growth for powder coatings shall be propelled on account of the presence of major automotive and nylon manufacturers. This will in turn drive the DDDA market in the region. Asia Pacific, led by China and India, held the largest share of the global (dodecanedioic acid) DDDA market size in 2015 and is forecast to witness the highest gains at more than 6% CAGR by 2023. Positive growth indicators in the regional construction and automotive industry is the key factor attributing the business growth. Furthermore, rapid industrialization in the region shall boost product demand for industrial grade paints & coatings. The global (dodecanedioic acid) DDDA market size in 2015 was consolidated with top four industry participants accounting for over half of the total share. Key industry share contributors are Evonik, Cathay, Invista, BASF SE, UBE, Zibo Guangtong Chemical, Verdezyne, and Santa Cruz Biotechnology. The prominent industry share contributors are extensively involved in R&D toward bio-based product development to abide by the environmental regulations along with meeting the increasing product demand. Dodecanedioic acid, commonly referred as DDDA, is primarily used in top-grade coatings, painting materials, corrosion inhibitor, engineering plastics including nylon 6, 12, and antiseptics. Positive growth indicators in the global end-user industries including construction and automotive will substantially boost the product demand over the projected timeframe. However, the prevalence of stern government norms toward VOC emissions along with the existing substitute threat from sebacic acid and adipic acid may hamper dodecanedioic acid market size by 2033. Resin applications help the largest share in 2015 on account of the high nylon demand across the globe. However, powder coating applications shall observe the highest growth by 2023 due to the expanding paints & coatings industry, particularly in Asia Pacific.